Figure 1: Top: The stellar mass density (SMD; mass in stars per unit volume) of the universe over cosmic time. The green and blue points show recent observations. The red line, with grey error regions, is the best fit to the observed data. The solid black and dashed black lines show the inferred density from star formation history (SFH) observations. Middle: the ratio of SMD with a constant recycling factor to an evolving recycling factor. Bottom: Ratio of the SFH fit to the SMD fit. Figure 2: Top: The star formation rate density (SFRD) over the history of the universe. 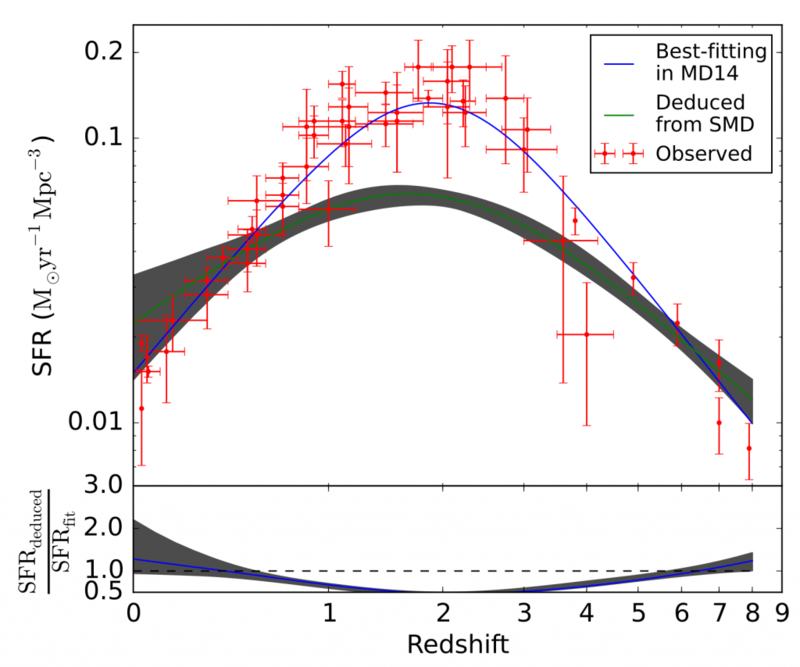 Red points show observations of the star formation rate, and the blue line the best fit. The green line, with grey error region, shows the inferred fit from the stellar mass density measurements. Bottom: the ratio of the SFRD measured from SMD data to SFR data. Today’s paper looks at observational data on these two properties, and shows a puzzling inconsistency. 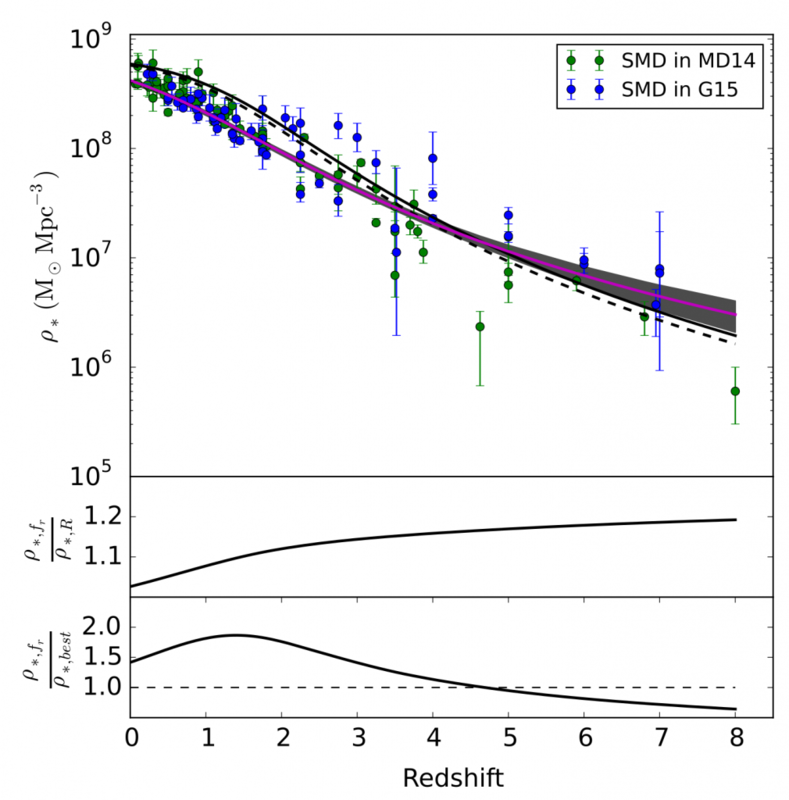 The black line in figure 1 shows the SMD expected if we add up all the star formation from the SFRD measurements – it’s clearly higher than the observations. Similarly, the green line in figure 2 shows the SFRD we would expect to fit the SMD measurements, and it is much lower than the observations, by a factor of four at redshift two. So what’s causing this discrepancy? The authors highlight a few possible causes. The fits are sensitive to the fraction of mass that is removed from stellar deaths. This is linked to a property of new stellar systems known as the initial mass function (IMF), which tells you what the distribution of stellar masses is in a new star cluster. If there are more massive stars, then we would expect a higher number of stars to die in a shorter amount of time, increasing the fraction of mass removed. Local observations suggest the IMF is pretty unchanging, but if it’s different at high redshift this could account for some of the discrepancy. They also suggest there could be systematic errors in the observations, either of the stellar mass and the star formation rate. The mass of a galaxy is dominated by old, low mass stars, since these are the most numerous, but its light is dominated by young massive stars. This leads to what’s known as the outshining problem, whereby the light from the stars that make up most of the stellar mass is hidden behind the light of a few massive stars. This effect could be particularly pronounced at redshift two, where star formation rates are much higher. Future observations at high redshift, particularly those that can probe the IMF across cosmic time, should help shed light on the cause of this conundrum. Fortunately, a number of giant 30 metre ground based telescopes are in the works (see the GMT, TMT and ELT), and the James Webb Space Telescope will also soon be launched – together these telescopes will probe the high redshift universe in unprecedented detail. Until then astronomers are left to ponder what ingredients are missing from their models of galaxy evolution, or whether there is something more fundamentally wrong with our picture of the universe. Magnetic fields? Stars imply galaxies imply galactic magnetic fields? Would promote magnetic alignment and the singlet state, reducing the spin temperature ?